How do you live with the effects of ageing? Growing older doesn’t mean life stops. But how do you cope when your body and mind start wearing out? Have you ever heard someone say, “I remember when…?” Do you say it yourself? I remember standing by my grandpa while he drove the tractor on the farm. Whenever he’d tell me stories from the past he’d start with “I remember when.” Years later his memories started to fade and I felt the relationship fading away too. Listen to Richard as he talks about memories, and how to cope when they start to fade. I’m not ready for my parents to be old! We hear about the fact that we’re living in an ageing society but what about when it becomes personal and it’s your parents that are getting older? Listen as Celia and Richard explore the challenges adult children face as their parents get old. Sometimes circumstances force dramatic changes in our lives and it can be difficult to adapt. How do we cope with the things we lose and is there anything to gain Listen to Celia as she talks with Norman and Hazel who had to leave their family home and move into a retirement village. As we get older we need to adapt to a lot of changes. Are the signs of age wearing you down? Do you wonder how you’ll cope with the challenges? This week on Messages of Hope, Noel Due has some good news about getting older. We’re living in an aging society. There are more people over 65 than ever before with an ever growing demand for aged care support. How do families negotiate the transition into aged care? This week We’ll be talking with Annette who’s worked in aged care for over 30 years. Annette will share encouraging insights for families facing the move into aged care. Have you ever heard or used the saying, “I remember when…”? Remembering who we are is important to us. In Australia we have public holidays to help us remember who we are. On those days we often hear stories of freedom and the sacrifices that people made for us. Please join us this week on messages of hope as we talk more about remembering who we are. Where’s hope when you or someone close to you is diagnosed with dementia? Inside this booklet people share their stories about living with dementia. They provide invaluable insights into dementia for the sufferer, carer and the community. They share what helps, what doesn’t help, and the positive impact we can all have on people struggling with dementia. You’ll discover that in spite of dementia, there is hope. 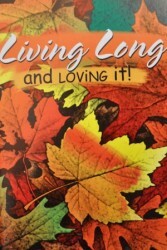 Living Long and Loving It! Faithful living through all the seasons of life, including retirement.